Here's a quick 3D print timelapse of Skeletor! I initially saw this print on WildRose Build's channel and wanted one for myself because I was totally impressed at how this prints without supports! This is printed on my Prusa I3 MK2.5 with Proto-Pasta Galactic Empire Metallic purple HTPLA at .15mm layer height. Here's a link to the model on MyMiniFactory. LEGO D.Va is pretty awesome! Here's a build video I made where I also tried some stop-motion. Spoiler alert, it's hard to do! And here are some pics! LEGO D.Va and Reinhardt are available at Walmart & Target for the cheapest price I can find! Trying out a new style of video for building LEGO. Here's my LEGO Reinhardt build! 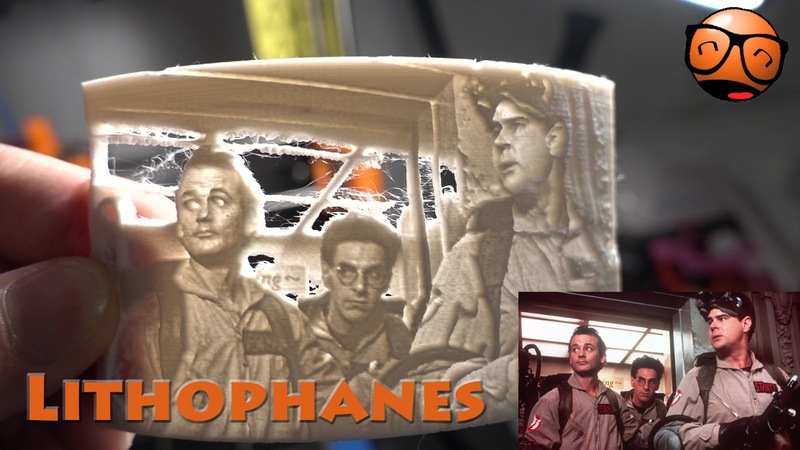 Lithophanes basically look like topographical maps but when they are backlit, a picture appears. They have been around for hundreds of years, but I've only recently discovered them and that they can be 3D printed. So I took a couple of photos, one of the Ghostbusters, and one of myself with Michael J Fox and converted them to lithophanes. I learned how to do these from YouTube channel RCLifeOn. The basic process is picking a photo and going to http://3dp.rocks/lithophane/ to have a printable lithophane file created. Make sure your Model Settings Thinnest Layer is set to 0.4mm. And make sure your Image Settings are set to Positive Image. I then upload my picture, choose Outer Curve as my model, run the program and download my STL file which I then send to my Slicer program. I printed these at 0.1mm layer height with no support, 100% rectilinear infill, 1 top, 1 bottom and 1 perimeter layer, and a 5mm brim to help it stay attached to the build plate. Obviously, you can play around with these settings, but that's a good place to start. These prints took about 4-5 hours at those settings. 2018 was another fun year of going to conventions and making stuff! Here's a look at some of the things I did this past year! My second year at Emerald City Comic Con was so much fun! I got to see so many amazing cosplayers and makers there!